Sunday: Just a casual denim skirt look today. Still not able to wear my heels yet but I did feel a little better enough to try out these mid heels. I think I held up rather well but definitely didn’t try to push it. Maybe one more week or so and I will be back in my heels (“fingers crossed” lol). Anyways, since you all know that I am a big fan of the graphic/message tee, I thought why not present a message that I believe in and represent “Team Christian/Team Jesus”. “Whoever acknowledges me before others, I will also acknowledge before my Father in heaven. But whoever disowns me before others, I will disown before my Father in heaven” (Matthew 10:32-33). Enjoy your week and our finally back to Summer weather! God Bless! Sunday: So I’m in flats once again. One of my fellow heel-loving sisters at church asked me “what was I doing down there”. To which I rebutted that I regretfully have to wear flats for a while due to my surgery I had a week ago. Yeah, I’m still a little sore and although I did try on some heels to see how they felt, they are just not going to work for me right now! And I don’t have any idea when I will feel comfortable enough to get back into them. So it will be flats for now. Even closed toe flats aren’t very comfortable. Thank God that I had it done during the Summer when I am able to wear open toe shoes cause that would not have been a good look in the Winter. So it is definitely a challenge getting dressed knowing that I have to wear flats. The majority of the outfits that I put together go better with heels. But now I have to be more creative to include flats and still feel polished and put-together while doing it. No matter what I wear, wearing flat shoes with it just always makes me feel more dressed down. I’m uninspired when I have to wear flats. I guess it’s just because I don’t have many options. Not that I don’t have enough flats to choose from but just that even though I own several different styles of flat sandals, they are all the same (or shall I say they all give the same look to an outfit). Just saying! 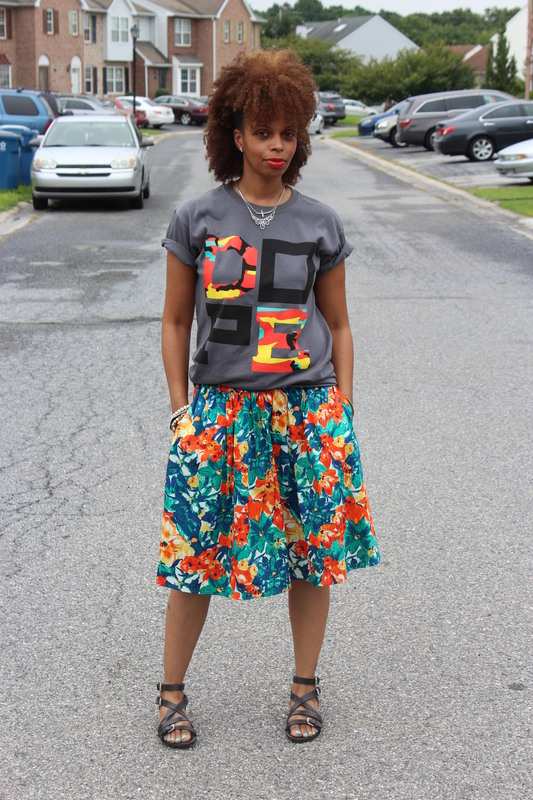 Anyways, this skirt is another cast off from the Duro Olowu x JC Penny collection. 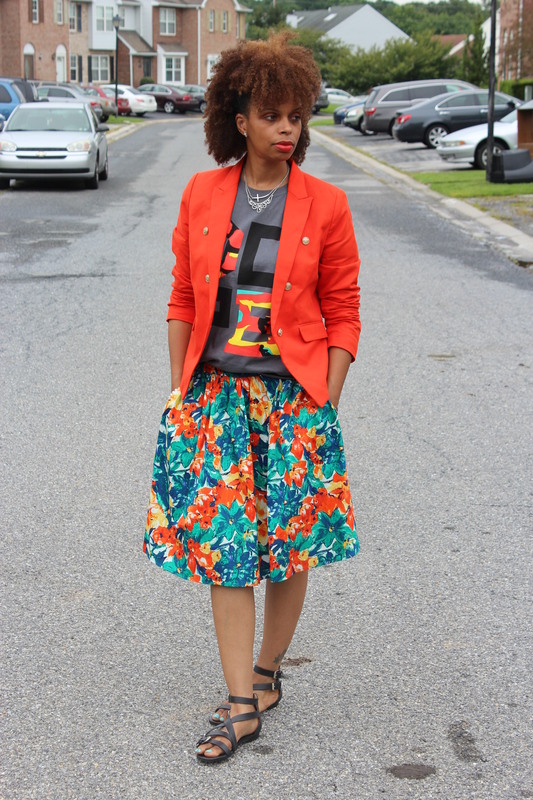 I love the length and the bright colors. I dressed it down with the t-shirt. 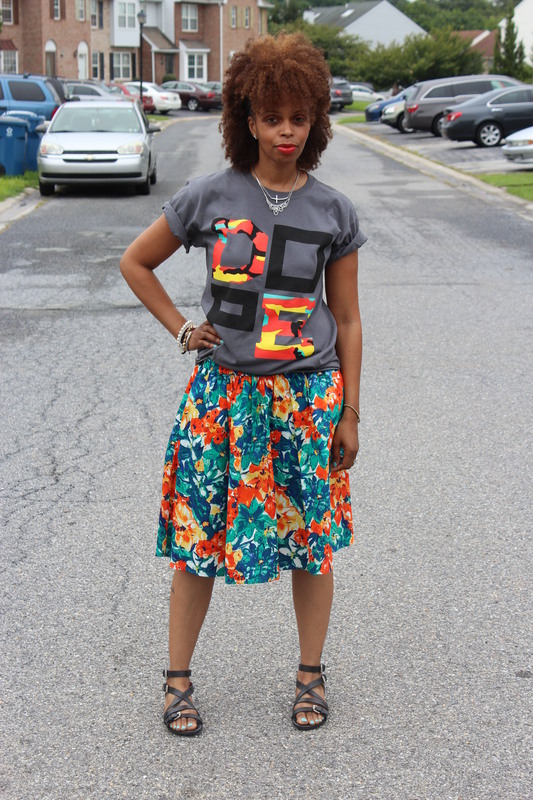 I like how the colors in the tee pick up the colors from the skirt. When I did my hair like this today, I realized that I was rocking the look of Ola Ray from the Michael Jackson “Thriller” video. I know y’all remember her. I loved the style of her Jheri curl. 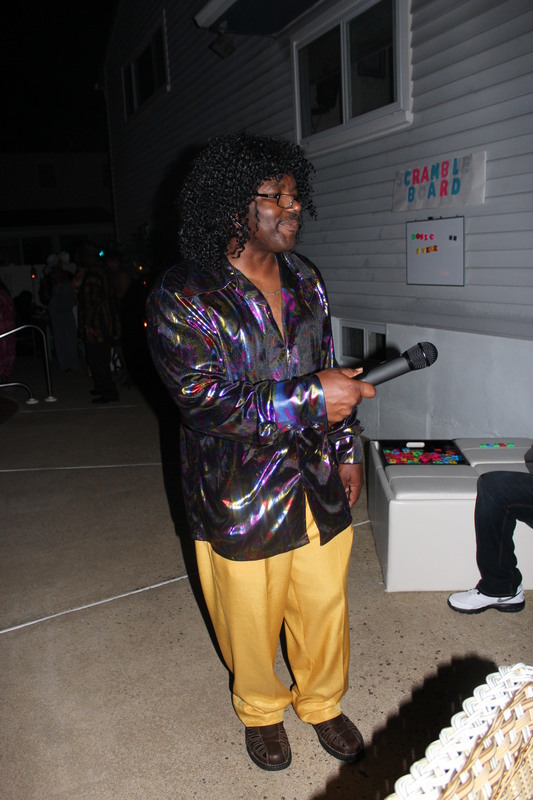 Yeah, I had a Jheri curl! And what? I was always one to follow the trends and the curl was one of them! Check out this video tribute to Michael that Ola did. She looks great at 52 yrs old but I don’t know how her mental is!! What do you think? God Bless! 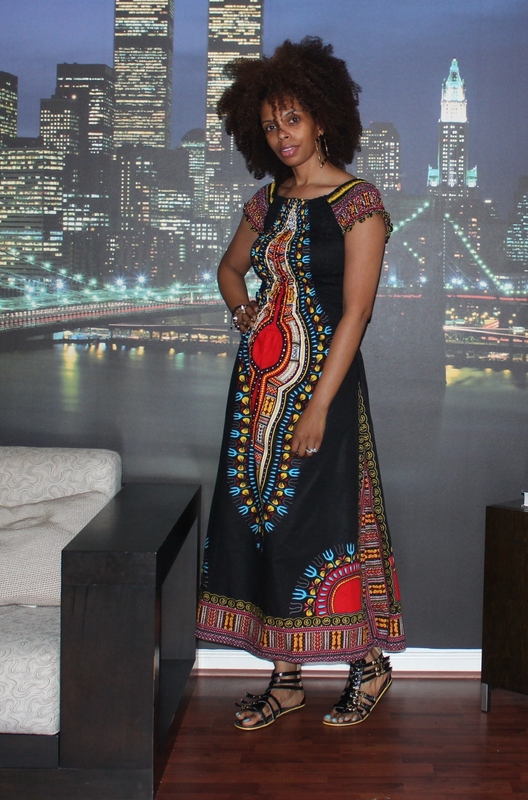 Friday: I wore this dress to run out to do errands. I really didn’t feel like going out let alone getting dressed so this was the easiest and most accessible thing to wear. That’s what I love about dresses in general, they are a no-brainer because it’s just one piece to throw on so you don’t have to worry about putting pieces together. 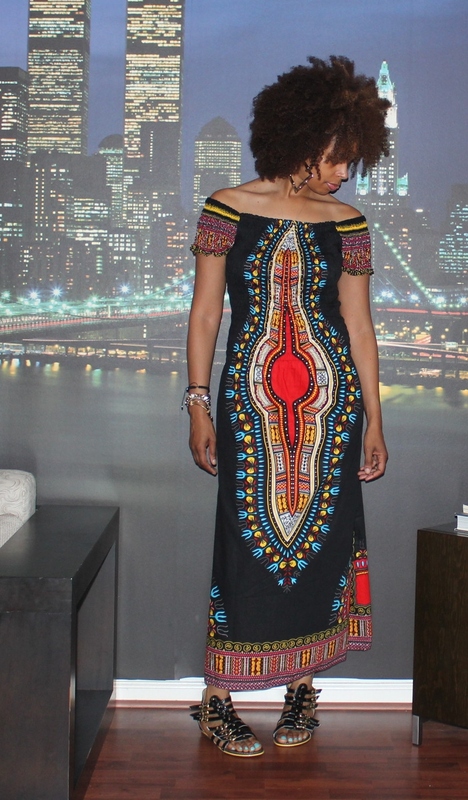 So this dress is the one that I bought when my sister and I went to Odunde Festival back in June. 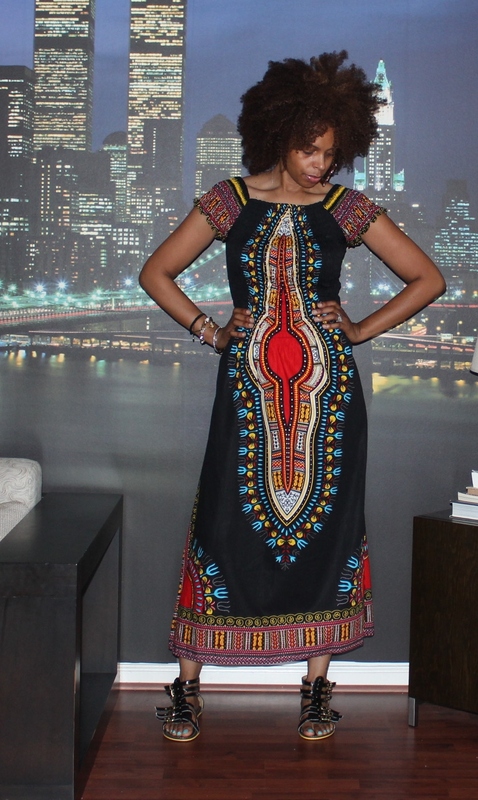 I searched every vendor for the perfect African print dress and this one was it. I love the fit, the print and the price was right. I styled it two ways (not really styled but just changed it up a little, lol). I love that the sleeves are elasticized and look good up on the shoulders or off the shoulders for a more sassy look. I just noticed, but I love how the print going down the front give me an hour glass/curvy shape. Well, that’s all for now, short and sweet (for once, haha! I know). God Bless! 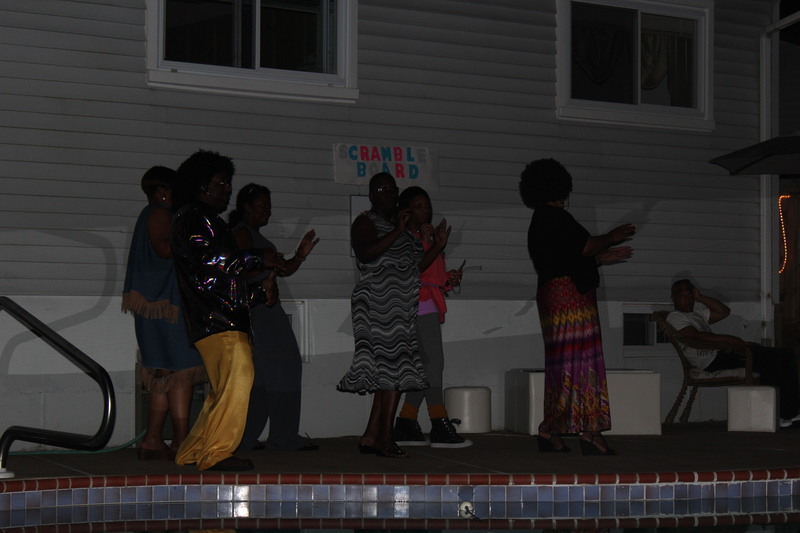 Saturday: Just a few pics from a 70s/80s party that I went to. 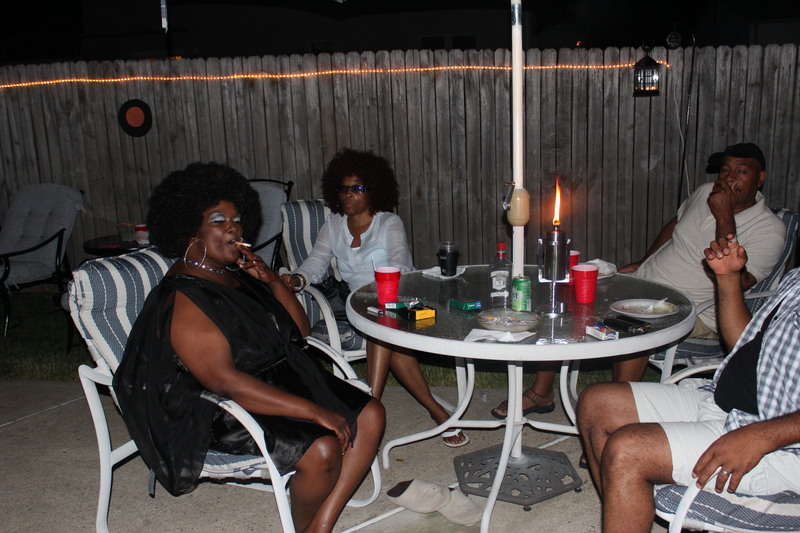 I decided to do the 70s thing since it is one of my favorite fashion decades. I thrifted this maxi dress a while ago and was planning on wearing as just an everyday dress but with modern touches like I did with this one. 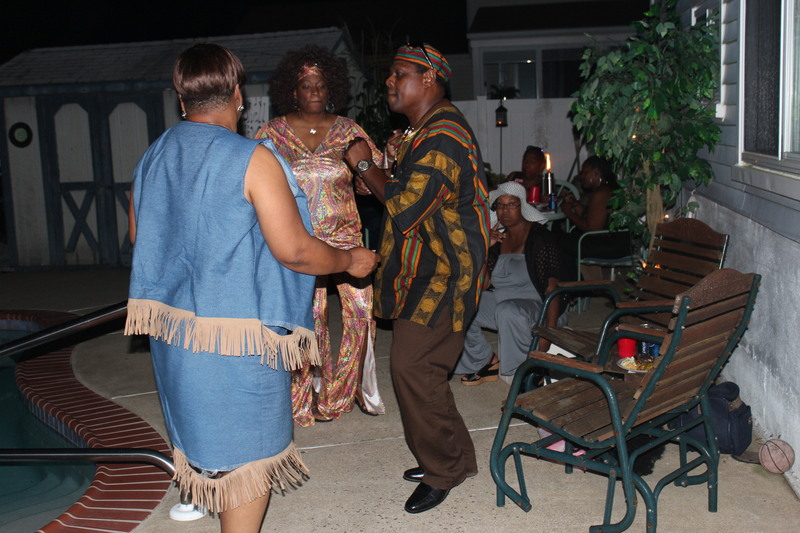 But when I was invited to this party it gave me the opportunity to wear and style it according to its time period. I instantly knew that I was going to rock the afro puffs. 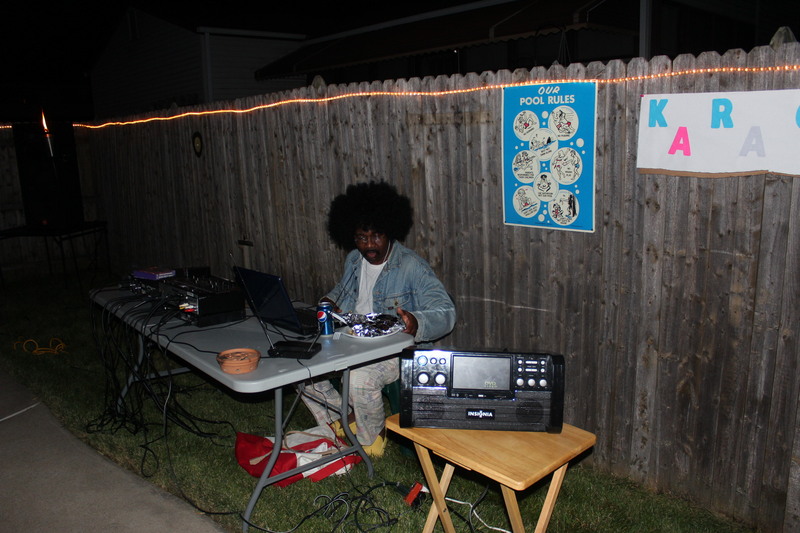 That was bonus of having natural hair, I didn’t have to wear the afro wig I just used what I already had! The blue eye shadow was also the makeup trend in the 70s. It was either blue, purple or green. And of course, hoop earrings are a timeless staple that has been worn in every decade. The only disappointment with the whole look was that I was unable to wear shoes due to procedure that I had on my feet the day before. Oh well, maybe the next time! P.S. 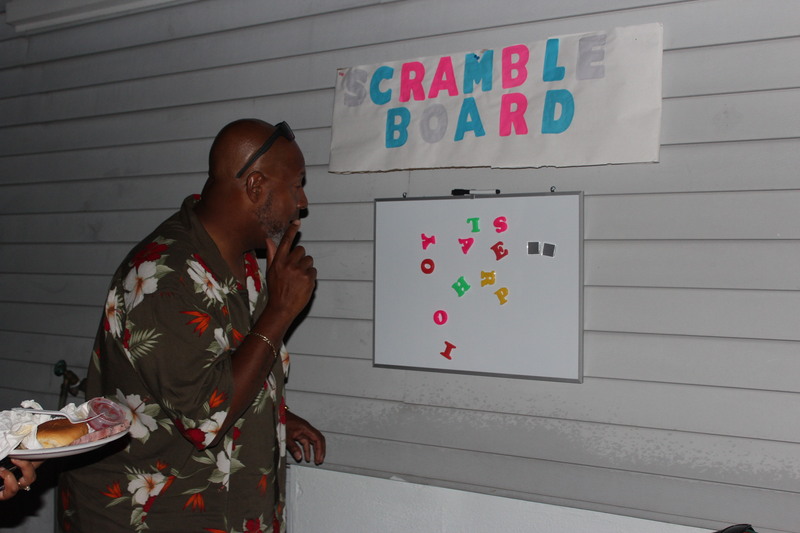 : how do you go to a themed party and not dress the part? Idk, just saying! Anyway, I have a few more days in these lovely surgical shoes, hence the lack of outfit posts this weekend. I just don’t feel right without a pair of shoes to complete an outfit! Hopefully, this weekend I will be back in regular footwear. Even if it’s not heels, I just miss shoes/boots/flats, anything, please! Y’all know how I love a pair of shoes! I am going thru withdrawls! Ok, I digress! Until next time, God Bless! 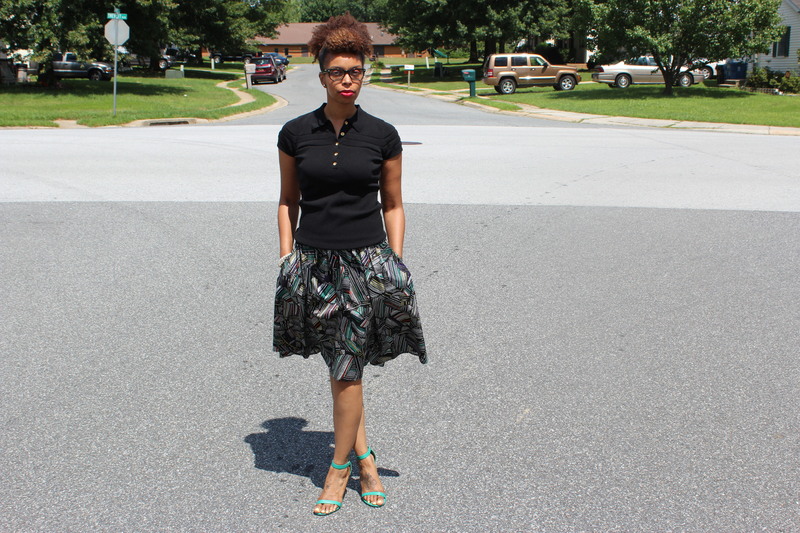 Sunday: This skirt is another piece from the Duro Olowu Collection with JC Penny. I now believe that I almost have all of the pieces that he made for them. Minus the two coats that I still want. I have to scour the clearance racks of some other JCP stores to see if any are left. But anyways, since the skirt is focal point of the outfit, I came everything else simple by wearing this basic black polo shirt. 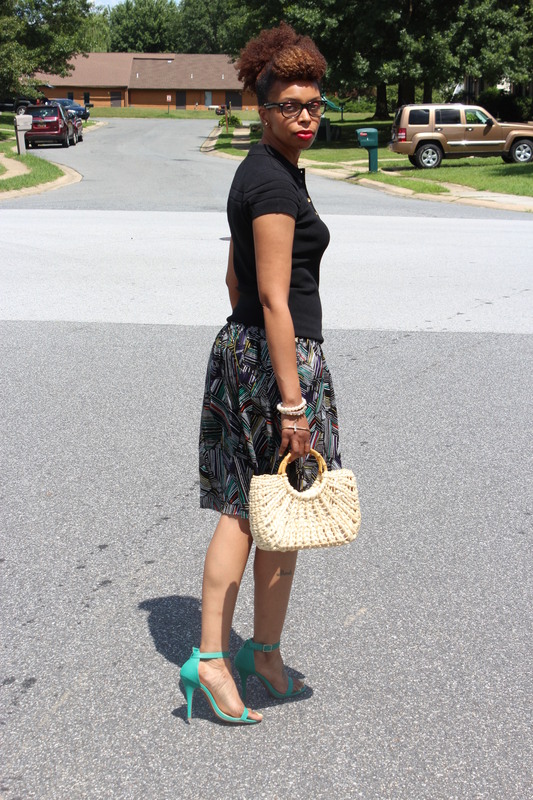 I pulled the green from the skirt and used these sandals for a pop of color. Also loving my new hand bracelet that I found while digging thru the bracelet bin. I initially thought it was some kind of deformed, irregular bracelet that had been squeezed beyond its normal shape. But after looking it over closely, I realized that it wasn’t your average bracelet. It was meant to go over your hand, not your wrist. How awesome, I thought! I instantly had to have it since it was so unique and unlike anything that I had ever seen. I know, it doesn’t take much to get me excited when it comes to fashion! Oh well, what can I say! You gotta have passion about something! And fashion is just one of my many passions. I call it my fun fashion. The others are more serious and life touching. Alright, enough for now. Hope you had a great weekend! God Bless! Friday: Yes, it’s that time again! School will be starting in 3 short weeks. So that means time for school shopping. Only for the past 3 years, Javar has been wearing uniforms. So now that he is entering high school, we have to shop for not only school supplies, but new clothes. Which I am excited about because everyone knows that I love fashion and shopping for clothes. It doesn’t just stop at shopping for myself, but for anybody else. And because he is his mother’s child, he loves shopping for clothes too. He knows what he likes but I know he will be open to my suggestions too. So this was my school shopping outfit. 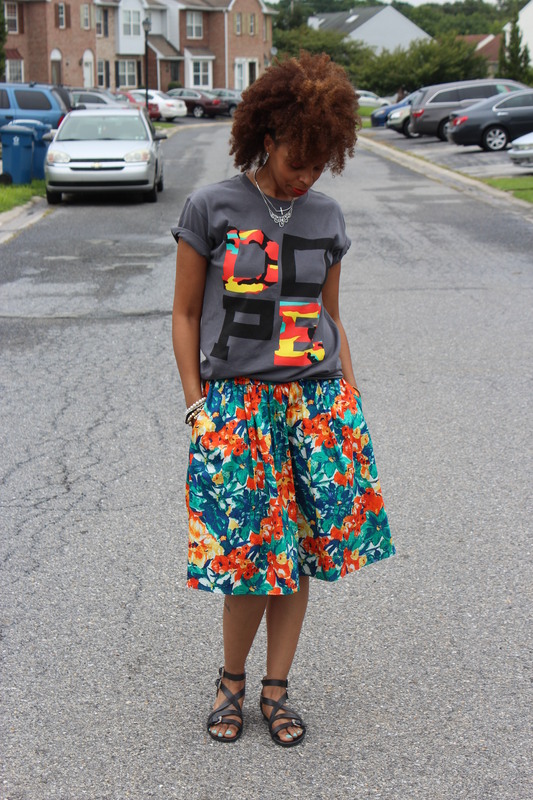 Finally wore this skirt that I bought probably well over a year or so ago. When I purchased it, along with the olive green one (yeah, multiples again, lol! ), I knew I wanted to dress it down. 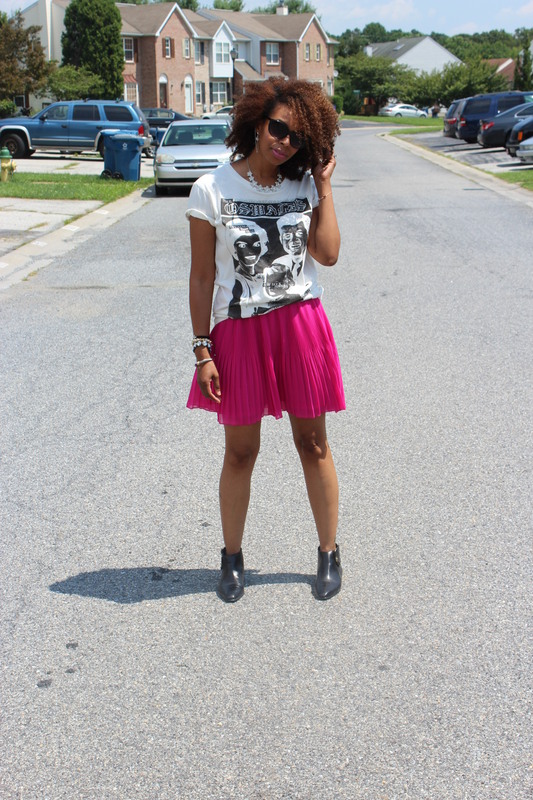 So this tee and Beatle Booties did just that. 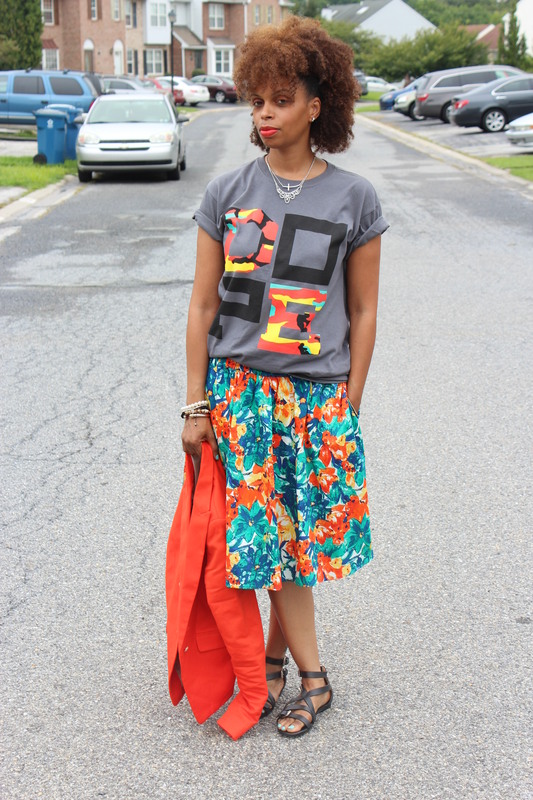 I like taking something that’s supposed to be dressy (chiffon-y skirt) and throwing a tee on with it. 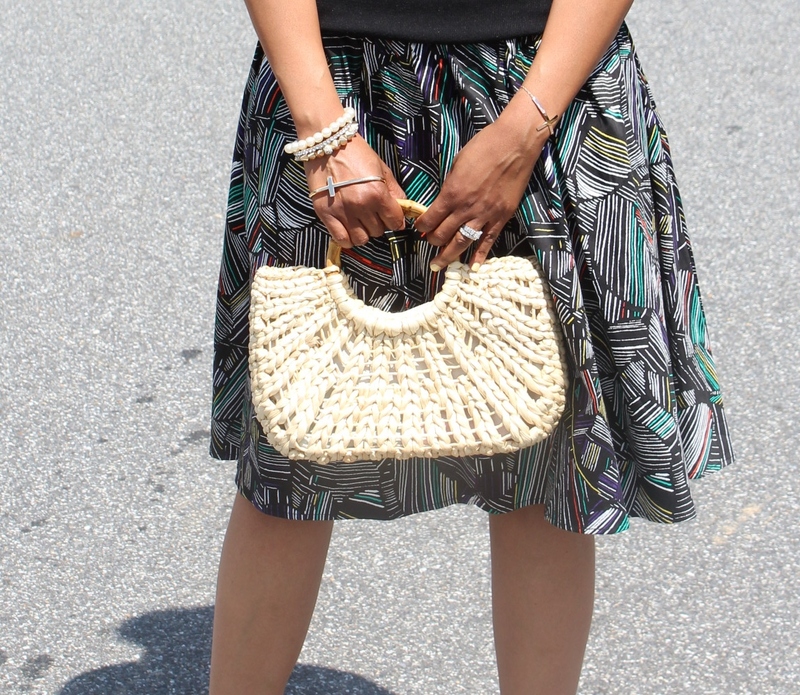 It just makes the whole outfit less fussy and more effortless. And of course, wearing another one of my many new earcuffs. Anyway, that’s all I’m gonna say about it. God Bless!